Vishweshwar Hegde (Vishu) is in IT industry for the last 33 years. 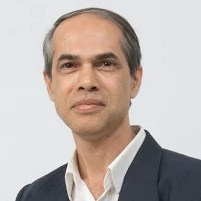 He has worked in organizations like Indian Institute of Science (IISc), Aeronautical Development Agency, Motorola, Mindtree in various roles like R&D, hardware & software development, project management, delivery management, Quality and Business Excellence. Before joining PM Power Consulting, he was Senior VP & global Head of Business Excellence at Mindtree. Currently he is engaged with multiple organizations in training, coaching & consulting in Agile & DevOps Transformation, Project Management, Delivery Excellence, Mindfulness and Strategic Consulting areas. He is active in industry forums like NASSCOM & BSPIN. He holds a bachelors degree in Electronics & Communication from Mysore University and Masters courses in Computer Science from IISc, Bangalore. His other areas of interest include Trekking, Hindustani Music, practicing Yoga & Homeopathy, study of ancient wisdom and applying it to contemporary management, leadership areas. Do you have the EI for AI Challenge? The gist of this session is about why and how of Emotional Intelligence (EI) to deal with the Digital Technology context effectively. Developing Digital solutions with Technologies like AI, ML, DL, IoT, Big Data etc. needs large number of diverse skills and ecosystems collaborating together and handling significant complexities of different disciplines. Tremendous possibilities from these technologies are leading to rapid innovation which make Business Agility essential. Rapid learning curve needed to pick up new fast emerging technologies and their application in diverse areas is making Growth Mindset a survival mantra. All these aspects need higher EI at individual, team and leadership level. Business Agility is achieved through proactive & quick sensing of Customer/Market needs and fulfilling those needs through end to end collaboration of Customers, Business Functions and Solution Delivery Functions in a seamless flow. Apart from technology and process elements, the critical success factor for such functioning is the mindset and culture aspects of people and organization units across the value chain. Mindfulness is a great tool to develop Emotional Intelligence which is the bedrock of leadership tenets for Agility Culture like proactiveness & self-organizing, cross-functional collaboration and facilitative leadership styles. Creation of a Mindfulness@Work framework called BE-DO Framework – Being Mindful and Doing Mindfully. Being Mindful by Being Aware, Alive and Calm; Doing Mindfully by Perceiving Immersivity, Processing non-judgmentally and Performing Empathetically. Mindfulness techniques and practices at individual level like BreathWatch, BodyScan, Balanced Breathing, Journaling. Organizational and Team ceremonies to inculcate Mindfulness as part of work practices like Mindful Meeting, Sense Walk. Results captured after 6 weeks of practice of Mindfulness practices by the participants on Personal Wellbeing, Personal Effectiveness and Professional Performance. Organizational Change Management including unique role called Happiness Evangelist. The session will be a joint presentation by the Happiness Evangelist and the Mindfulness Coach. It’s a known fact that only 10% of the iceberg is visible and 90% is submerged & not so visible; what moves the iceberg is not the externally visible winds, but the subtle undercurrents beneath the surface. Similarly more than the hard, visible aspects like processes & tools, what makes or breaks DevOps is the soft aspects of people, leadership & culture, like self-organizing teams, collaboration across the organization at all levels & servant leadership. The talk elucidates some of the critical success factors in these areas while adopting DevOps. In our coaching/consulting engagements we notice that when organizations embark on Agile transformation, typically they focus on the mechanics, ceremonies, tools - addressing 'what' to do and 'how' to do. There is less focus on 'why' certain practices should be done - the fundamental rationale behind Agile. Without understanding the rationale, instead of applying the Agile Principles & Values in the right context, organizations tend to make it a prescriptive process. Such Agile implementations are sub-optimal, often counter-productive, as true culture change does not happen. This talk brings focus on 'why' aspects of Agile - fundamental rationale behind Agile. It shows how the traditional software production was influenced by the Industrial Era thinking, the changes needed in Knowledge Era context and how Agile provides the scaffolding to build true Knowledge Enterprises.